Consider Partnering with us.............we would love to have you on board to help in anyway! It is our honour and joy to work in playing music for Worship in our own network of Churches(Tree of Life) and further afield. We see our main job as facilitators.....providing an all inclusive, safe and exciting platform to help our brothers and sisters explore their own creativity in Worshiping our most Awesome God. As well as writing our own songs .....we encourage others to share their gifts and we also explore the many Worship songs that are being sung across the Body of Christ. 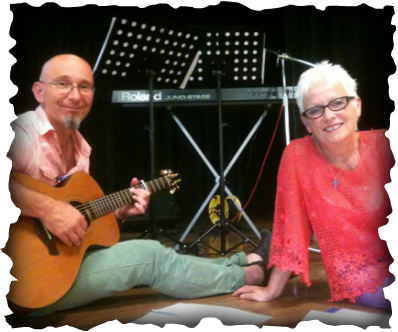 It is a real privilege to travel with our music - we're currently working with Open Door, a Christian charity based in Spain led by the lovely Ken and Carol Robertson. We are now both self employed.....Chris working as a Handyman/Gardener/Painter & decorator and all round odd job man!! Von as a mobile Sports & Holistic Massage Therapist. This sets us free to travel and play music for conferences etc when the need arises. Father God told us He would be the best employer ever and of course He is true to His word!